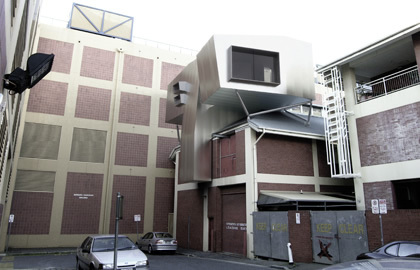 Australian Experimental Art Foundation - AEAF. 2 - Using their formal appearance to justify a similar, yet inhabitable, roof-top furniture. 3 - Anticipated surgery so as to transform an airconditioning unit into a studio space. This proposal for an combined visiting artist studio and residence upon the rooftop of an existing facility takes as its starting point the often overlooked but extremely pervasive air-conditioning unit installed on top of rooftops throughout the city. Exploiting the schism between content and form, the proposal is both familiar - by taking on the formal appearance a air-conditioning unit - yet uncanny -through its parasitic relationship to its primary host the AEAF. This formal and visual ambiguity- at once familiar yet strangely alternate- parallels through its appearance the visiting artist(s) residential relationship to the city - being at once of the city yet at the same time entirely distinct from it. Second, the proposal aims to be catalytic transforming the existing facilities both programmatically and formally, whilst having a dynamic relationship with the context. Swerving away from both representational and formal models endemic within the discipline, the proposal takes on a performative role within the city as it aims to multiply meanings as each artists' shifting relationship to the residency alters between blind indifference to fully appropriating the architectural object. Through both extending and enlarging both the scope and ambitions of the AEAF Artist Studio + Residence brief, the proposal aims to provide something at once both surprising through its subversion of given expectations (i.e. a residency) and supplementary to both institution and observer - James Curry.